Zoe is one of the rarest zebras in exsistance. 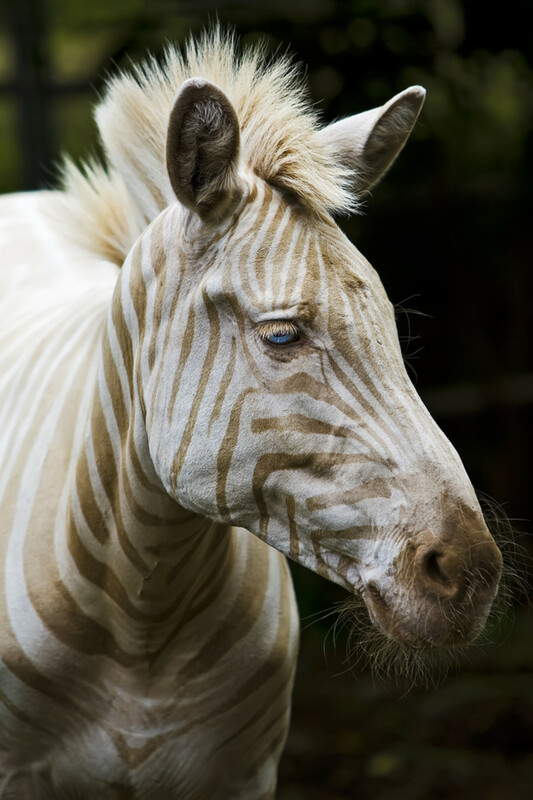 She is what is called a Golden Zebra, although some refer to her as a “white” zebra. Zoe is the only Golden Zebra known to be in captivity at this time. Zoe was born on the Island of Molokai, Hawaii in 1998 and shortly after her and her mother, Oreo, were moved to the Three Ring Ranch, which is an animal sancturary on the Big Island of Hawaii. 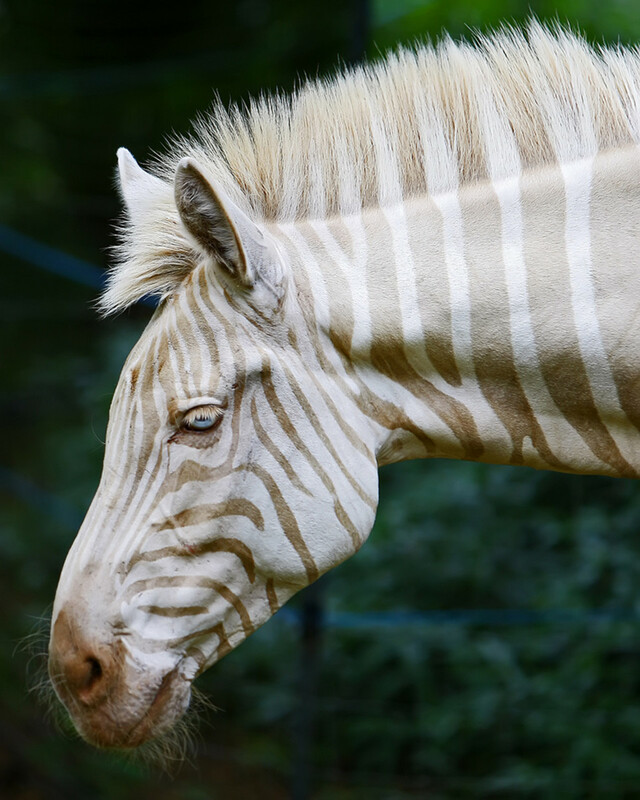 Sometimes called a "White Zebra"
Many people refer to Zoe as an albino, but Zoe actually is not an albino zebra. She has a condition called amelanosis. Amelanism, or amelanosis, is a pigmentation abnormality characterized by the lack of color pigments called melanins. Albinism is the complete absense of color pigments or melanins. Zoe’s body is white and her stipes are a beautiful golden beige color. She also has beautiful bright blue eyes! As of now, the only health problems they are aware of is the fact that she has poor night vision. As she ages she may incur some complications due to the amelanism such has kidney problems. As a precaution she is fed a low protein diet and is monitored closey for skin cancer, which is more common among animals with amelanism. Because of her condition, Zoe will not be bred. Amelanism can be a very dangerous condition to have if you are a zebra on the plains. Zebra’s stripes are used as camoflauge and to confuse their predators. The main predator of the zebra is the lion. Lions are known for being color-blind. Since zebras run close together in herds, all the lion sees is a mass of lines moving up and down and it makes it harder for the lion to pick out one individual. However, if there is one individual in the herd that does not blend in, the lion can easily pick them our from the rest of the herd. 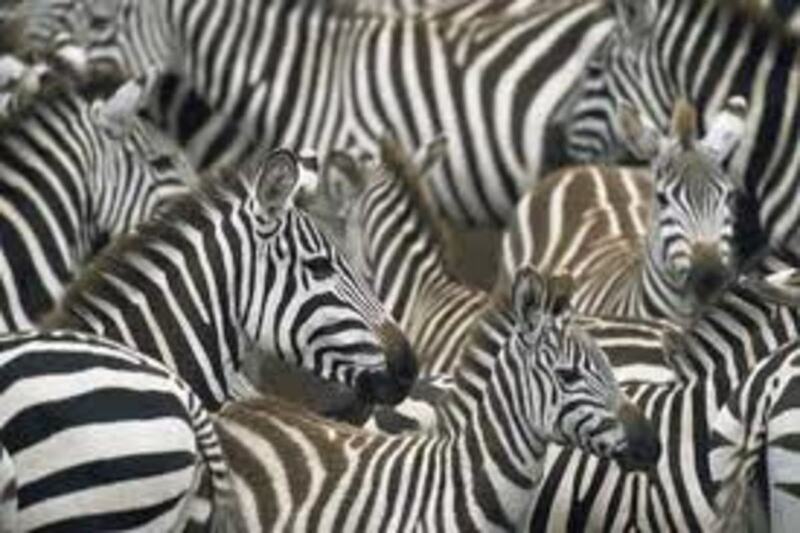 A zebra with amelanism would probably only last a few days in the wild. This is the reason that Zoe was taken to the Three Ring Ranch. She would not have lived long in the wild. The Three Ring Ranch is a private sanctuary located on five acres on the Big Island. 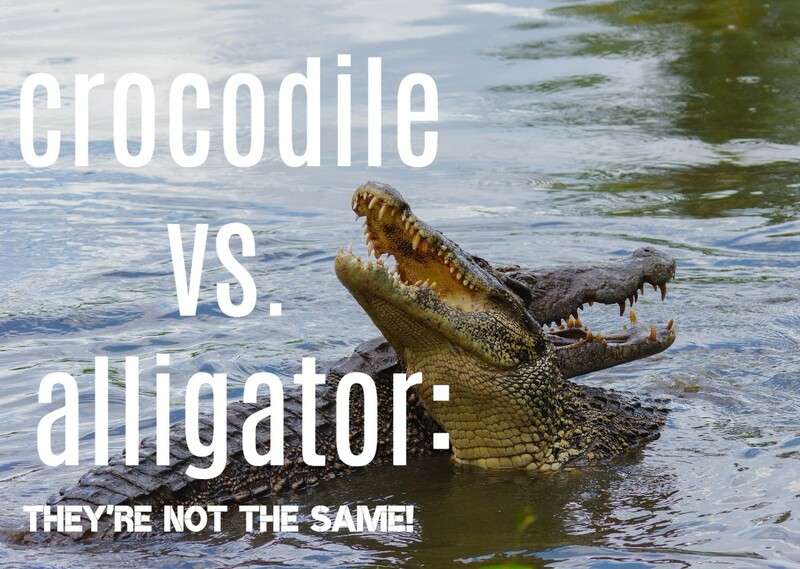 It was founded in 1998 and is Hawaii’s only fully accredited, USDA licensed, exotic animal sanctuary. In 2000, they became a non-profit organization and can boast that 100% of every donation goes toward animal care and education. The sanctuary is run entirely by a volunteer staff and no one makes a salary. Not long ago, Zoe’s mother, Oreo, gave birth to a new baby, Tootsie. Zoe didn’t know what to think about all this as Oreo was very protective of little Tootsie for a while and would not let Zoe come around. She would even bite and kick at her. 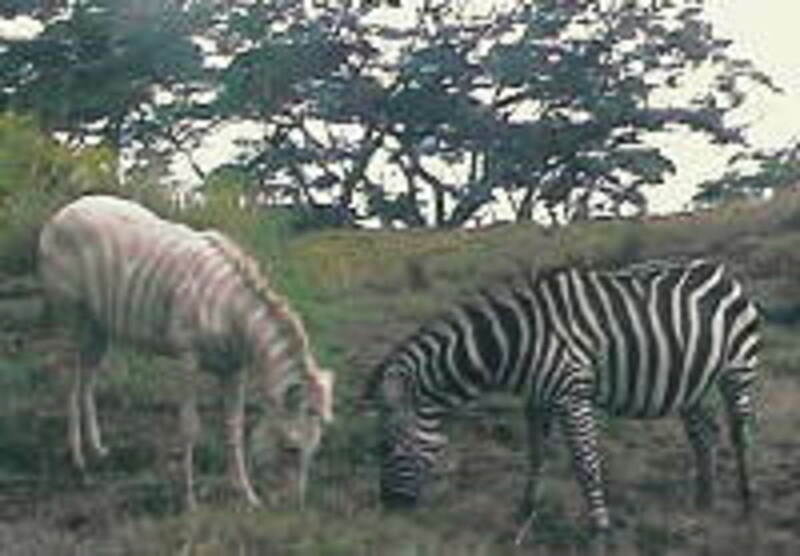 One reason for this could be that zebras stripes are also used as an identification tool. Some zoologist believe that when a female zebra gives birth, she will try to prevent the foal from seeing other zebras. Thus the foal lears the pattern of it’s mother’s stripes and is able to find her just by sight. Zoe now spends her nights seperated from Oreo and Tootsie by a wire fence. Since zebras are herd animals it is very important that they maintain visual contact with each other in order to remain calm. It only took about a week for mom to settle down and now Zoe and Tootsie are happy playing together. There have only been reports of two other Golden Zebra’s in captivity. The first was in Germany approximately 100 years ago! The second was in a zoo in Tokyo in the 1970’s. Zoe is the only Golden Zebra known to exist in captivity today. This is the original article written on Zoe, by me and the photos of Zoe are the original photos taken by Bill Adams on his trip to Hawaii, used with his permission. Had you heard of a golden zebra prior to this hub? Researched the golden zebra after watching Lion Guard and found this article. Then I found another article stating that Zoe died in 2017 at the age of 19. No details as to what caused her passing. is zoe breed with Oreo AND another horse? is there only one golden zebra in the world. Thanks and it is nice to know. They do survive in the wild, I have seen one in the Masaimara, which abounds with lions and other predators. I decided to have a "White Linen' Hawaiian LUAU with the Senior Adult Ministry at church after making a purchase of some gold and white zebra print. I needed a center piece and decided on a zebra. Pleasantly surprised when I discovered Zoe. I purchased 3 zebras from "A Touch of Class" to use on the entrance table. It never too late to learn or to teach. Thanks for the information. Sheila, this was so interesting to know about Zoe's pigment condition. Thanks for sharing her story in this amazing hub. The colors on her are beautiful for her breed. I find it fascinating that each zebra's stripes are unique. The untrained eye certainly doesn't see that. Zoe is beautiful. The first thing I noticed were her crystal blue eyes. You provided an interesting education here, Sheila! Very cool - Thumbs up and Beautiful! Shared! I enjoyed this article on Zoe so much that I decided to come back and read it again! I wonder how Zoe and her sibling, Tootsie, are getting along these days? Very interesting...thank you for sharing! Zoe is so pretty and I love those crazy blue eyes! I've never heard of a golden zebra so this is a new on on me. At first glance, I thought she was albino. Amelanism and albinism are essentially the same. Caramel colored albinos are simply a tyrosinase positive form of the condition. T negative is the far more common condition with the standard red or pink eyes. T+ is beautiful though, isn't it? I've never heard of the Golden Zebra--what a beautiful and fascinating animal! Thank you for a well-written and laid out Hub. I really enjoyed reading this. That's so interesting! I had to come see the golden zebra you mentioned in your liger comments. Might've heard of a liger before and seen pictures of them, but I've never even heard mention of a golden zebra until now! Thanks. Learn something new every day. . .
As interesting as this is, Lions are not completely colorblind. 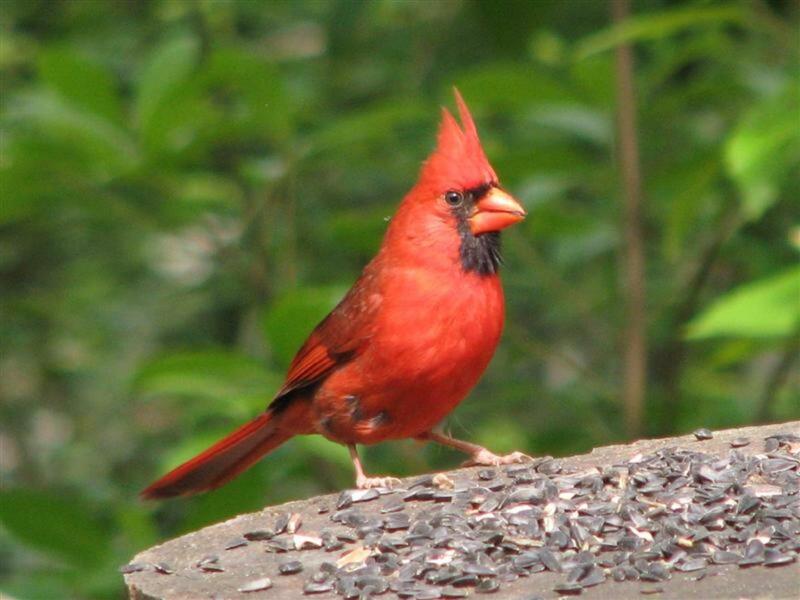 They have the same range of color vision as household cats. Most lions can see shades of blues and greens and distinguish between them. However, they cannot see red, or many other colors. She is beautiful. I didn't know there was a zebra like this thanks for the sharing this. Voted up. Very interesting. I'd never heard of a golden zebra, although I know that a lot of animal species show variations. I must say she's beautiful and definitely different! I enjoyed reading this hub. Thanks for sharing!! :) Rated and shared! Zoe is such a lovely golden zebra. How unfortunate she is suffering from this condition than can lead to health problems late on. Maybe science can find an answer to this one day! Thanks for keeping me in the loop....I had not heard of this lovely unusual creature. These are such fascinating animals to begin with and now to know of this special one is very intriguing. All sorts of interesting information here on Facebook. These "golden zebras" are they the only variation in color? Is there a jet black zebra as well? What a beautiful creature! I had never seen a zebra any color other than black and white. So glad she is in safe place, thanks for sharing! How amazing, what a beautiful zebra! I had heard of a golden horse before ( www.letssmiletoday.com/pictures/16046-golden-horse-beauty-30-8-2012 ) so I guess why not a golden zebra! Interesting hub! I have never heard of a golden zebra before. I really enjoyed reading about Zoe! Could the coloring of Zoe be similar to a dilution gene found in other equines, such as the cream or dun gene in horses? And if so, could it be possible to plan to breed such zebras (as there are zebras in captivity that are used for many purposes, and bred to horses even). 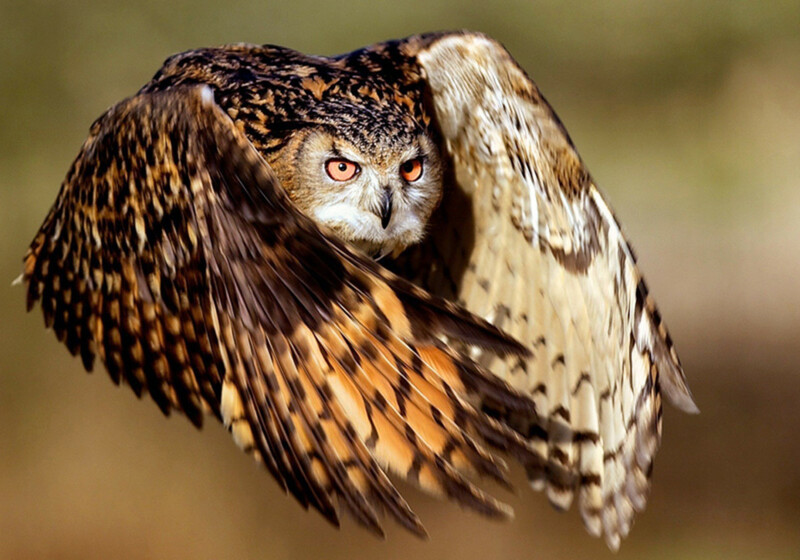 What a beautiful animal - I enjoyed your article and am so glad that Zoe is safe in a shelter - as you say, those animals that stand out from the species are the predators first target - B. If she were bred they would have to raise the baby in captivity. That is why she had to be "rescued". Being different, she would be easy prey for lions. I agree it is sad though that she cannot have a "chid". Thank you for your wonderful comment! Hello Jessefutch.I didn't realize their existence either until I saw a picture of her and just had to find out more. Thank you for stopping in and commenting, it is always appreciated. Have a great day! Hello Peggy ! I thought she was so beautiful the first time I saw her I had to find out more and share. Thank you for stopping in and commenting! Have a great day! So interesting. I think she should be allowed to breed. Bad enough she is born different but she should be allowed to have what comes naturally and missing becoming a mother I think is a cruelty to her myself. That is like taking over for nature. No love and no children, that is sad. Incredibly interesting hub. I've never even knew such a thing as a Golden Zebra did (or could) exist. Thanks for this amazing work! How very interesting! Hope that Zoe lives a long and happy life in her sanctuary in Hawaii. Nice that she gets to interact with her mother and sibling or future siblings. She certainly is beautiful. Up votes and sharing. Was thinking how do the Zebras keep from getting dizzy looking at each other in the herds, but of course the stripes are for lion camo lol! Zoe sure is special and an excellent animal to write about on here. 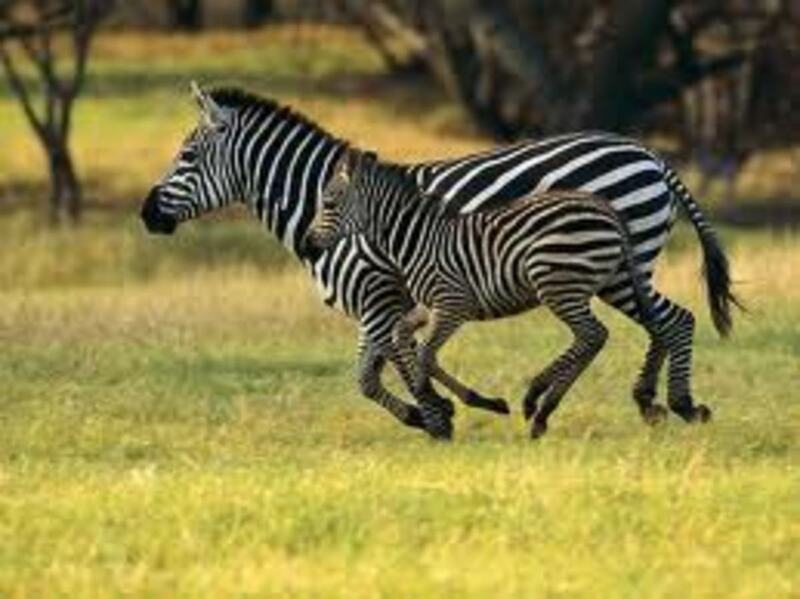 Some cool info too, like on how mom Zebras teach their young to recognize them. Glad blue-eyed Zoe is in good hands cause the lions probably would have gone for her quick. Up n + + Shelia. So interesting to learn about Zoe, her condition, and her lifestyle. :) She is beautiful, as is her mother. Thanks for this look at the unusual golden zebra. I never knew there were such things as golden zebras so thanks for finding out about them and sharing your knowledge with the rest of us. Beautiful creature - and I'm so glad it was given a chance at survival by being taken to the ranch. Voting this Up and Interesting. A beautiful animal and you have written about her so well. I didn't know there were zebras on any of the Hawaiian Islands. Voted you up, interesting, and beautiful! Will share. Sheila, this is amazing. Zoe is absolutely beautiful. I'm so glad that she is being well cared for. Thanks for sharing. So amazing! Zoe is lovely and unique. Voted this up, useful, awesome, and interesting. This was a cool hub. Never knew they existed. I didn't even know that lions were color blind, explains the stripes of the zebra. Zoe is beautiful. This was a great story! How interesting! I love stories like this. Zoe is so beautiful and I'm so glad she's being protected. Thanks for sharing this story. Voted up! I love learning new things. This is very interesting hub, and enjoyed reading. what an interesting and informative hub. you have done a great job here. I love the names of these animals, Zoe, Oreo (milk anybody), and Tootsie. great write. Interesting Hub with Awesome Pictures!!! Thank-you for sharing Zoe!! !